I have just met Lynton Green, the Treasurer of Warrington Council. We talked about Risk Management and its application to the management of change. Many radical changes are being explored by Warrington Council in an effort to maintain services within ever tighter financial restrictions. They are including Risk Management right from the start in the process of scrutinising new (and old) proposals. They are not pretending risks do not exist, but they are not so scared of every risk that they cannot do anything. They are seeking cost-effective ways of managing risks and looking at them in the light of potential savings or other benefits. One thing we agreed on was that the alternative approaches are far from risk-free. What alternatives? You ask. Either putting your head in the sand and hoping the country’s economic problems will go away, or merely continuing to cut a percentage off every budget, like slicing salami. This usually means cutting risk-control measures such as repairs, maintenance, inspection, training, supervision and staffing levels. So if anything does go wrong as a result of implementing any new ideas, let us remember how much more would have probably gone wrong had they not been implemented. It was refreshing to come across an organisation that takes risk management seriously, but is not afraid to experiment. There is a lesson there for every organisation, large or small. Review your insurance cover at least once a year. Are all exclusions and extentions on your policies relevant? Do you need them? You can waste money on unnecessary insurance and you can make false savings by failing to insure your real risks. Insurance is one element in Risk Management. It is a means of managing the financial aspects of many kinds of risks. Picture Question What is it about a giraffe that makes it a good risk manager? 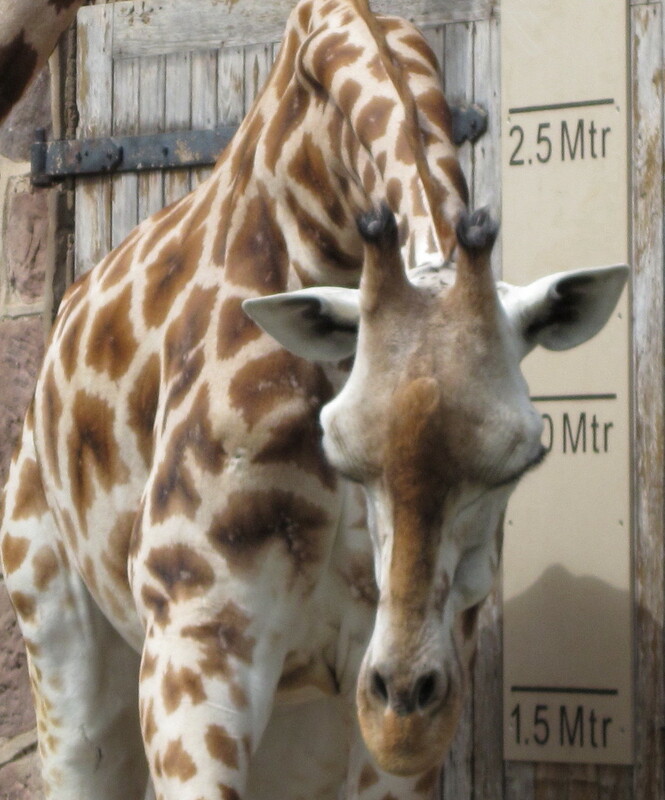 Giraffes’ height and good eyesight enable them to see danger, whether a lion or simply a hole, before it is too late. Risk Management is about identifying problems and solutions before the worst happens. The world is full of risks and they can all apply to almost everybody. So we all need to manage them. The size of a claim or loss does not always relate to the size of the contract or activity concerned, nor to the size of the business carrying it out. I remember a claim where a plumber went into a school to install a toilet and ended up burning most of the school down by using a hot cutting torch too close to inflammable material. I also know of a claim which resulted from an office block being destroyed by an explosion caused by a spark from the ignition to a boiler when it ignited fumes from a substance being used to lay a new floor in one small office in the building near the boiler. Again that was a small job being done by a small contractor, but the losses were far greater than the original cost of the job. One of the most bizarre cases I know of concerned a “country fayre” in Scotland where a falconry display was disrupted by high winds which blew a large vulture off course and into the airspace around Glasgow Airport, leading to the temporary closure of the Airport. I have no idea how much the resulting delays to flights would have cost, but it was probably much more than the cost of putting on the falconry display. In many ways, small businesses need to take more interest in Risk Management, because they are more vulnerable. Big businesses can withstand more losses. How long for example would your business survive if you could not have access to your office or workshop? What if your computer systems failed? Small businesses need to know what their risks are and have arrangements in place to reduce the chances of things going wrong and also have plans to enable them to cope if such things do happen. Don’t leave it to chance: take control. How to Review Your Claims Handling Procedures to Survive the New Legal Regime. 1.Response times cut from 90 days down to 40. Yes, 40. (There had been plans for 60 but 40 is now law). Defendants now have to respond with an admission or a detailed defence within 40 working days of the receipt of a public liability claim, or 30 for an employer’s liability claim. 2.You will not get all your costs back even if you win. If you successfully defend a public liability or employers liability claim you will no longer be able to recover your legal costs from the claimant except in certain unusual circumstances. So What? These two changes mean that when you get a claim you have to decide quickly whether it is worth defending it and if so what your defence will be. Who does what: your insurers, solicitors, claims handlers, your own staff? Do you have all their contact details? Who decides whether to defend or pay a claim? Within your organisation, who exactly does what, and do they know what to do? Are there different arrangements for different types or sizes of claim? Are all your risk assessments up to date and easily accessible? Are your other records up to date and easily accessible, such as inspections, training, CCTV, accident reports? Now is the time to do this, not after you receive a claim. Myths About Risk Management: No.1. I certainly do encourage managers to use common sense, but regrettably not all have it. Even if you do have it, you should create a system so that those around you, or those who follow, who may not think like you, have something to guide them. You may also need sometime to provide evidence of how you established the procedures and policies you have. It is also unfortunately true that most of us do not make our best decisions when we are under stress. So when things go wrong it is best to have a written Plan B to turn to rather than having to think on your feet. The emergency services have lots of plans and procedures to fall back on when things do not go the way they expected. They know the limitations of even the best of common sense. Let us follow this example of best practice. Why We All Need to Review Our Claims Handling Procedures. Response times cut from 90 days down to 40. Defendants now have to respond with an admission or a detailed defence within 40 working days of the receipt of a public liability claim, or 30 for an employer’s liability claim. This can be achieved only if your systems are efficient and effective. You have to hit the ground running: it is no use starting to draw up a plan or discuss who is going to do what after the claim has been received. You will not get all your costs back even if you win. (If you are a defendant that is!) If you successfully defend a public liability or employers liability claim you will no longer be able to recover your legal costs from the claimant except in certain unusual circumstances. So you need to think carefully as to your reasons for defending a claim and to be prepared for having to meet some of your costs. You may consider it worthwhile if it puts off other claimants with doubtful claims, but do so with your eyes open. And insist on clear estimates of costs from your solicitors. These are two major changes to the world of claims and we all need to change with them. Always insist on feedback from your insurers, solicitors, or whoever handles your claims. Have your money’s worth. Whether you win or lose there are always lessons to be learnt. Find out what you could have done differently to have prevented the claim or to have achieved a better outcome. There is always something. Then act upon it. Do not be caught out again. Although frauds always seem to be getting more sophisticated and hi-tech, some of the simple old ones are still around. And still work. I know of a recent case of “ghosts” on the payroll, where a payroll assistant paid large salaries to members of her family who did not even work for the company. It was eventually discovered by a routine audit, but it cost the employers a lot of money before it was stopped. Are your systems protecting your business? Can you be held responsible for what others write on your social media site? Whilst the Board has no direct control of the Australian, let alone UK, Courts, it shows how things are going and it is probably wise to start checking your sites regularly and removing even favourable comments which might get you into trouble, even if not with the Law. These two animals photographed by me on a recent trip to Chester Zoo are an Asian Lion and an Asian Rhino, so that’s three things in common, but the most important is that they are both endangered species. For all their size and strength they are not surviving well in the wild. So how is your business? What could make you “extinct”? What are you doing about it? Do you need a consultation?